This aged cat in a rehoming rescue centre is seen to have differently sized pupils but nobody has noted a vision problem. One eye has this appearance in the fundus, while the other has a diffuse retinal greying – I’m sorry you might think this photo is a bit out of focus but the other side really was – it was difficult to focus on the ‘fuzzy’ image of both retina and disc….oh whoops -maybe I’ve given the game away! What is happening here and what might be causing it? This looks to me like a pretty severe optic neuritis, which would explain the anisocoria perhaps. With limited financial resources I’ve limited my work-up request to a Toxoplasma titre but what else could be causing this? 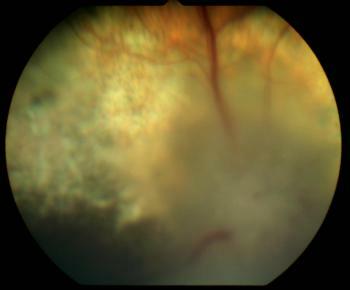 This entry was posted in Cases and tagged cat, optic neuritis. Bookmark the permalink.